FRANKFURT, Germany: In the wake of yet another devastating terror attack in Europe—which killed or injured over 140 on the streets of Barcelona—Germany’s leading newspaper published a lengthy interview with Nahdlatul Ulama (NU) General Secretary Kyai Haji Yahya Cholil Staquf. Headlined “Terrorism and Islam are Intimately Connected,” the interview was placed on the front page of the Frankfurter Allgemeine Zeitung’s widely-read Feuilleton (arts and culture) section, which also addresses moral issues that transcend partisan politics. Within hours of its publication, the interview was trending as one of the most popular articles shared in Germany. 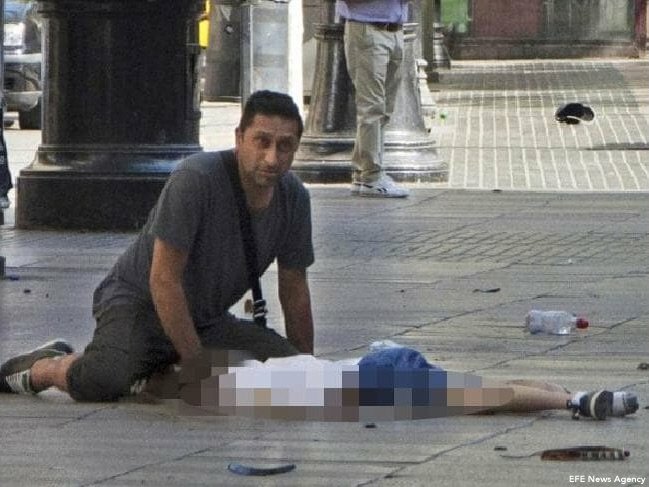 Harry Athwal, 44, stays with an injured boy after the Barcelona attack. One month earlier, the NU General Secretary delivered a video address to senior EU officials and representatives of the 28 Member States at the headquarters of the European Council, which defines the EU’s overall political direction and policies, as part of a broader expert presentation. That address, and the Frankfurter Allgemeine Zeitung interview, come at a time of acute social and political discord—within and between EU Member States—regarding the volatile issues of mass migration, the distribution of refugees and counter-terrorism policy. The NU aims to reduce polarization between Muslim communities and the West, and help generate the societal consensus required to address the threat posed by Islamist extremism and terror. If heeded, NU/Bayt ar-Rahmah recommendations could help reconcile severe policy differences—regarding Islam and Muslims—that threaten to rend the fabric of social harmony in Germany and other Western nations. Download a one-page PDF copy of this communiqué (minus images). View KH. Yahya Cholil Staquf’s message delivered to the Council of the European Union.